Despite creating 863,000 positions over the last nine months, private-sector job gains recently were overshadowed by government cutbacks. 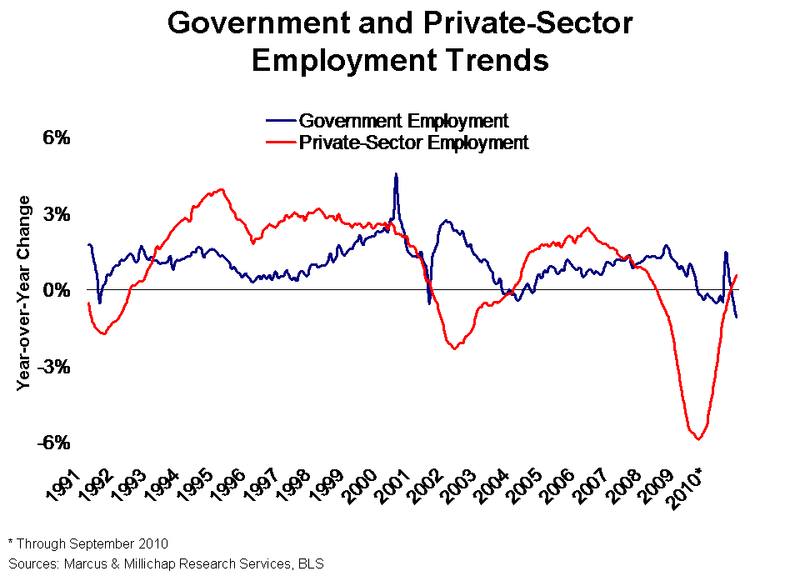 In September, tepid private-sector growth of 64,000 jobs was dwarfed by the elimination of 159,000 government positions, generating a net loss of 95,000 employees. Unlike the past few months, when scheduled census-related job cuts dominated total losses, the majority of government layoffs in September can be attributed to payroll reductions at the local and state levels. This shift illustrates the growing impact of budget shortfalls, which could become more pronounced if corporate confidence does not strengthen and companies remain hesitant to hire full-time staff. So far this year, the hiring trend has surpassed the rate of recovery from the 1991 recession and aligns similarly with the recovery from the 2001 recession. Corporate caution and fears of a double-dip recession remain headwinds to hiring, though the yield curve and most other economic indicators point to a slowdown, not another recession. Corporate dependence on temporary workers demonstrates this cautious stance, as the temporary help segment has expanded by 217,000 workers year to date, accounting for approximately 35 percent of all additions to nonfarm payrolls. This indicates manpower needs have grown, but companies remain hesitant to commit to full-time employees. Following the election, confidence in the economy should begin to surface, offering the potential for increased corporate investments in plant, equipment and people. It will take another six months, however, for momentum to build and shape a more stabilized outlook. Some bright spots emerged in the September jobs report, including strong gains in the leisure and hospitality sector. Job creation in the industry nearly doubled during the month to 38,000 positions, a sign households and businesses have begun to increase travel expenditures. Also encouraging was the addition of 16,000 jobs in the trade, transportation and utilities sector, which lost 2,000 positions during August. The education and health services sector, which expanded through the recession, contributed to private-sector job growth in September, though the net gain of 17,000 positions was down more than 50 percent from August. Improvements to apartment occupancy have leapfrogged employment market conditions, due largely to the release of pent-up demand as young adults re-establish independent households after moving home or doubling up through the recession. Year to date through the third quarter, vacancy declined an estimated 80 basis points to 7.2 percent, driven by the absorption of nearly 155,000 apartments. While the release of pent-up demand may keep absorption positive over the short term, the recovery in apartment market conditions will lose steam unless job growth gains traction. The hospitality sector made strong gains over the past year, both in terms of employment levels and property operations. As of August 2010, occupancy rates at the national level had increased to 63.9 percent, up from 60.1 percent just one year earlier, with gains recorded across all property tiers. During the same period, the average daily rate for hotels inched up 1.5 percent. Stronger growth of 5.7 percent occurred in the luxury sector, however, indicating that wealthier households, which account for an outsized share of spending, may be regaining their financial footing more quickly than the rest of the population. This entry was written by marcusmillichap, posted on October 12, 2010 at 11:21 pm, filed under Research and tagged Employment. Bookmark the permalink. Follow any comments here with the RSS feed for this post. Trackbacks are closed, but you can post a comment.